About a year and a half ago, during my review of Cole Swindell's sophomore record You Should Be Here, I made the statement that some might not see it that way, it should be considered the 'final' bro-country record. It was a record of endings, showing new paths forward, and while there have been attempts by some artists to reboot the subgenre, I still mostly believe that assertion. Yes, we will be dealing with 'Body Like A Backroad' in a few weeks but that seems more like the corpse of a genre that's still twitching, because we still have no information surrounding if Sam Hunt will ever release another record. Now whatever replaces bro-country is anyone's guess: between the neotraditional sound, the still-burning sparks in the indie scene, and even pop country that you might not like, but on average it is still better than what we were getting three or four years ago. And thus I have to be brutally honest: I kind of feel sorry for Luke Bryan. I shouldn't - over the 2010s he went all in on bro-country and made some truly awful music as one of its biggest figureheads, especially when deep cuts made it plain he was capable of better - but this is now an artist who is being left behind. People tend to forget that Luke Bryan is in his forties, and while his big bet on bro-country means he'll fill stadiums for the rest of his career, artistically you get the impression he has no idea where to go next. There was a recent profile piece published in the New York Times that discussed Luke Bryan, and while the entire thing was incredibly cringey, what stood out to me the most was how Luke Bryan wanted to get coffee with Sturgill Simpson, and at least until Sturgill provided the full quote in context, he didn't seem to have any interest whatsoever in Luke Bryan - whoa. Think about what this means: it might not have been the Kurt Cobain vs. Axl Rose beef of country, but it's hard not to see a similar dynamic between them - but you have to wonder with the Luke Bryan industry and machine around him whether he'd even be allowed to take a real artistic risk. And all of that is the reason I didn't just veto this album from my schedule when it was added. From the lead-off single I didn't expect a change in sound or content... but at the same time, Bryan has to be somewhat aware the ground is slipping away beneath him, and with his label choosing to release it in December, it might be a sign that he's trying something they don't view as commercially viable to the same extent. Of course, it could also mean even they think it's complete garbage, so what the hell: what did I find on What Makes You Country? Look folks, you might think after the last two Luke Bryan reviews i made that I'm the wrong guy to cover this material, but after entirely too many listens through these fifteen tracks, I think I understand why it's being released in December of 2017. Because while it might be marginally better than Kill The Lights, it's the sort of project that showcases a performer who probably deserves a lot better than what he's getting at this stage in his career - and without the big singles that made Crash My Party salvageable, plus this release timing, I can see this being forgotten very quickly. And believe it or not, there's a part of me that doesn't fully blame Luke Bryan for this, because as I've always stressed, he is a good singer. He has good vocal tone, real charisma, and with his deeper voice and preference for minor tones does tend to stick out from the crowd. But the big problem from Kill The Lights continues because his team has no idea how to properly blend his voice with the instrumentation he gets, in terms of matching the mix fidelity or the overall tone. For one, the vocal recording is just lousy: it's just bad audio engineering when his voice peaks in the mix as often as it does, and when he's placed up against Emily Weisband's very synthetic vocals on 'Hungover In A Hotel Room', or the slightly higher backing vocals on 'Out Of Nowhere Girl', it's legitimately jarring the difference in their audio fidelity. But it goes beyond that, because again, just like on Kill The Lights, nobody knows what tones to balance Luke Bryan with, and it leads to a record where synthetic beats and trap hi-hats are matched with real drums that always sound muddier, acoustic tones with a pickup as deep as your average Shawn Mendes record, pluckier organic elements that can feel jarringly out of place whenever some buzzy synth or atmospheric effect is tacked on and contributes nothing, and good luck hearing a bass guitar or any sort of groove! And what's frustrating is that not only is none of this new, but Bryan's producers are actively aping what was done better before and fumbling it - as much as some the production choices annoy me on 'Out Of Nowhere Girl', I like the piano progression beneath it, but it's also a brazen ripoff of Dustin Lynch's 'To The Sky' and has nowhere near the intensity or bombast! Or take songs like 'Bad Lovers' or 'Pick It Up' - what the blatant drum machine on the verses add to either of these songs, especially in the latter case which is trying to reference Ronnie Milsap? And here's the incredibly exasperating thing: I can't tell at this point whether the producers don't know what works with Bryan's voice or they're just too incompetent to care, because midway through this album, it does hit a tone that can work for him! The album's title track - while I have issues with how Bryan tries to excuse people calling his songs not country by saying that his upbringing and list-driven grabbag content excuses it - starts off okay, and by the time we get 'Most People Are Good', the acoustics are warm and mostly likable. Similar case for the prominent jaunty melody on 'Sunrise, Sunburnt, Sunset' - it's dumb summertime bro-country, but it's major keys, there's a good hook, and it's got some warmth to it, and when you follow it two songs later with the blatantly neotraditional 'Drinking Again' in its composition, I didn't mind it - I'm not asking Luke Bryan to make smart music here! 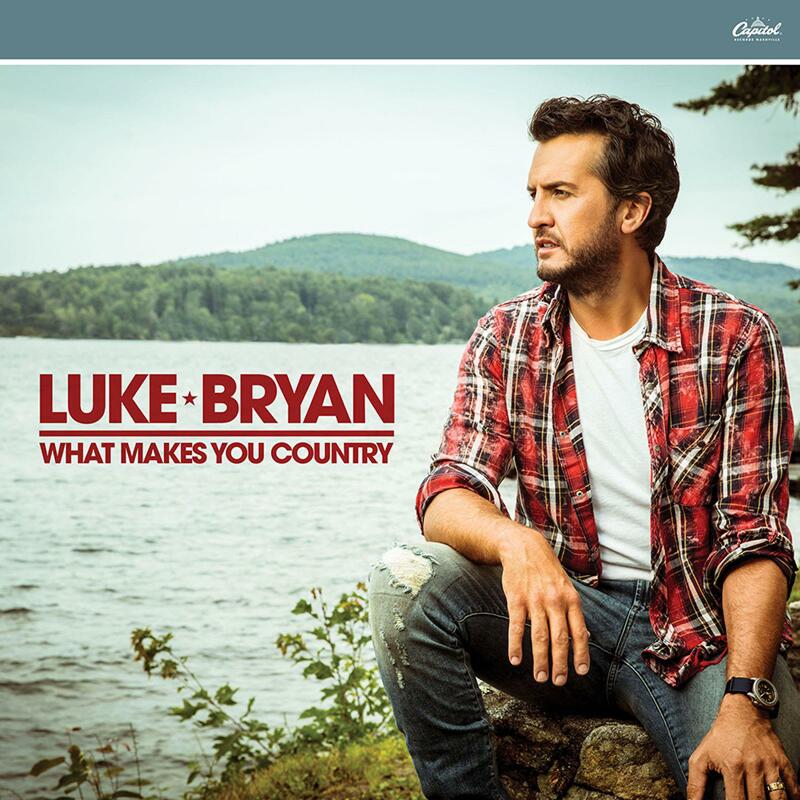 And the piano-driven 'Land Of A Million Songs' in celebrating the songwriting process, it's pretty damn good and something Luke Bryan can nail. And even if I don't like the content of 'Like You Say You Do', which is him trying to slide into his friend's relationship, the tone is really good - nearly all of it is underweight and lacking thicker body in the low-end, but it's a step in the right direction - hell, I could probably say the same thing about 'Hooked On It', but that's more because I just don't care about fishing. But right after that, the final third of this album takes a nosedive, and while 'Light Em Up' might have be the warning in its asinine phone drama against trap elements, it doesn't prepare you for a song like 'She's A Hot One', which is trying for grinding minor-key, brand-name referencing country rap in its main story because while she's a mess, she's a hot one. And it gets worse from there, from the blurry mess of tones, sloppy layering, hi-hats and Gucci references on 'Hungover In A Hotel Room' to the chopped-up, buzzy melody jacked from Toto's 'Africa' on 'Driving This Thing'. Hell, you can tell 'Win Life' is trying to bring it all home and highlight how love is all you need, and yet it's against a beat that sounded cribbed from Hoodie Allen! And do I even need to bring up lyrics here? While there might not be anything as nakedly stupid as 'Move' on this record - although 'Light Em Up' comes close, the problems remain consistent - songs overwritten with clumsy flows that don't tell stories, party songs consistently set in minor keys which with this production is nowhere near as edgy as they think it is, coupled with a few cuts that are a little more middle-aged but aren't bringing real insight to the table. There's decent sentiments - 'Most People Are Good' is utterly flimsy but you can tell Bryan is sincere in selling it, as is the utterly tepid 'Bad Lovers' or the relationship with his sons on 'Pick It Up' or even the goofier side of 'Drinking Again' - but it doesn't really challenge or stick with me, and I'm not seeing the lightning-in-a-bottle lyrical sentiments that made cuts like 'Play It Again' or 'Drink A Beer' actually hold up for him. I'm referenced a New York Times piece on Bryan early on, but it's a quote from his chief songwriter and producer Jeff Stevens that stands out: how there's nothing wrong with making music with a message, but people 'love not to think in today's world'. And thus while Luke Bryan avoids the darker, mean-spirited and considerably less good cuts that spoiled Kill The Lights for me, without any real depth in the writing or a willingness to go bigger, it feels very one-dimensional. And you know, that's not always a bad thing - that sort of music can work and be effective and fun if the execution is on point... but with every relisten and every production flub I can't say it is. Yes, there are a few decent deep cuts, but the final third of this record soured on me hard, and for as many units as Luke Bryan moves, there is no excuse for the production to be this slip-shod, amateurish and cheap. For me, this is a strong 4/10 and I cannot recommend it - even to Luke Bryan fans while this is better than Kill The Lights I don't really see it being as memorable, even the deep cut high points. And considering how and when it's being released, I think everybody behind the scenes knows it, and for as many stadiums as Bryan sells out, the more records like this he sells the closer I see an expiration date.